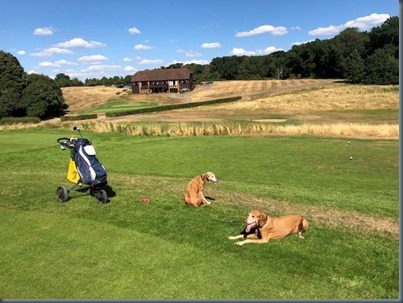 Welcome – Chobham gave us a delightfully warm welcome and noted that quite a number of members bring their dogs around for rounds. That is more than we can say for the first course we tried to golf at that day – Pine Ridge. We arrived and double checked on the dog protocol and they responded, “No, we don’t allow dogs”. 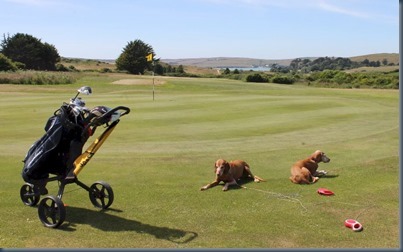 Now actually, I had Pine Ridge’s dog (friendly) protocol down verbatim in more detail than just about any other club from when I called them some months ago – “We do allow dogs to walk around the course with the players however your dog would need to be on a lead. 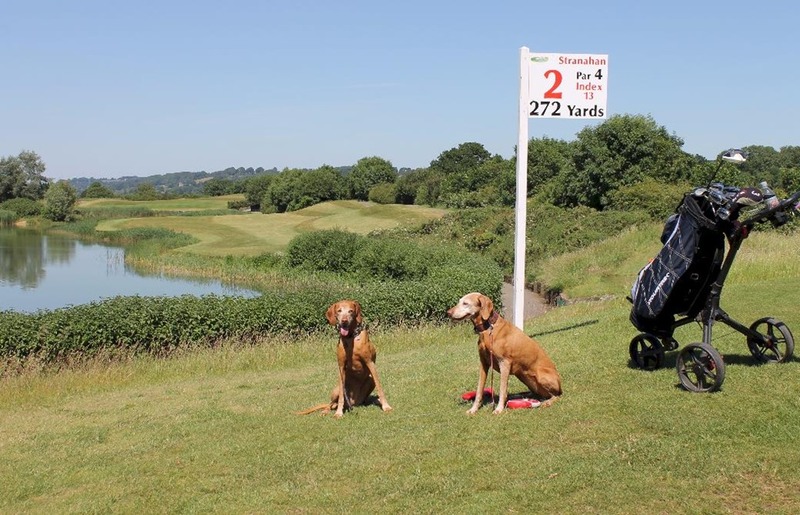 If your dog barks excessively we would ask you to take your dog off the course. No water on course.” That’s not something you make up or accidentally jot down. 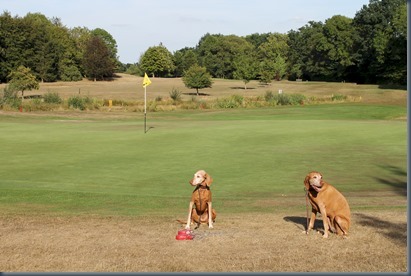 Fortunately, we were able to pull up DogGolf.info on the phone and find Chobham just down the road. But the incident did raise a few caveats. 1. 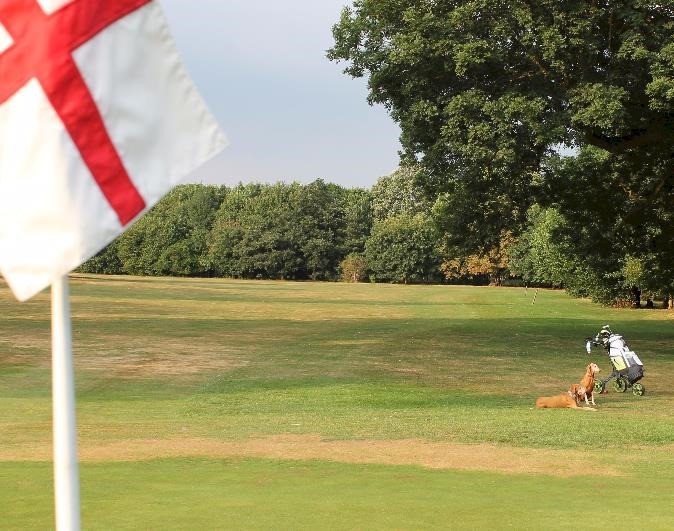 DogGolf.info isn’t perfect – I try to research and update all the information, but mistakes can get made (not least of which by the club itself, in fact the golf pro implied that a previous employee might have been misinformed). 2. Always double check – Protocols and be fluid and change over time. Or the club might have special rules on the for the day due to and event or some other reason (we had tried to call Pine Ridge several times, but their phone system was on the fritz so part of our problem was getting hit by the double whammy of faulty info combined with inability to double check as we usually do). Walk – Chobham GC is a remarkably picturesque course with dimension and variety in the landscape without alpine peaks to climb, and enough trees for shade without threading the needle through leafy couloirs. Water – Water, water everywhere…and plenty of drops to drink. 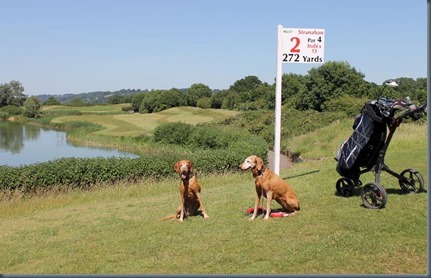 In fact, perhaps the most watery hole in the entire UK (at least the most of the many dog-friendly courses we have played) is at the 6th hole. There you will find an accessible lake (a nice graduated bank the dogs and walk down to get a drink), a toilet building (with a sink for refilling water bottles) AND a water fountain outside. A regular Minnesota of golf courses with its land ‘o lakes – 5 to be exact. Not pokey little water hazards, but proper, expansive ponds. Despite the scorching UK heat wave, these bodies of water were still ample and the dogs had a great opportunity to refresh along the course. Wildlife – Like the oases in the desert and the water holes on the savannah, where there’s water, there’s wildlife. And Chobham was more a Mutual of Omaha’s Wild Kingdom than just about any course we have seen. The standard line-up of woodland creatures, ie. squirrels, rabbits, but also a teeming range of water fowl, ie. big gaggle of geese marching across the 4th fairway, moor hens, blue heron. It was a good thing that the course had a lead required policy because I think even Rusty and Grace’s biddability would have been challenged. Wind Down – Too late for dinner service, but too parched to carry on home without a stop at our own water hole so down the road to a Doggie Pub recommendation, The Crown. A fenced in area at the front, a beer garden out back, and a welcome to dogs in the pub. A malamute puppy (and a big as Grace and Rusty combined) who is a regular greeted the girls with enthusiasm, but the girls were a bit less impressed. 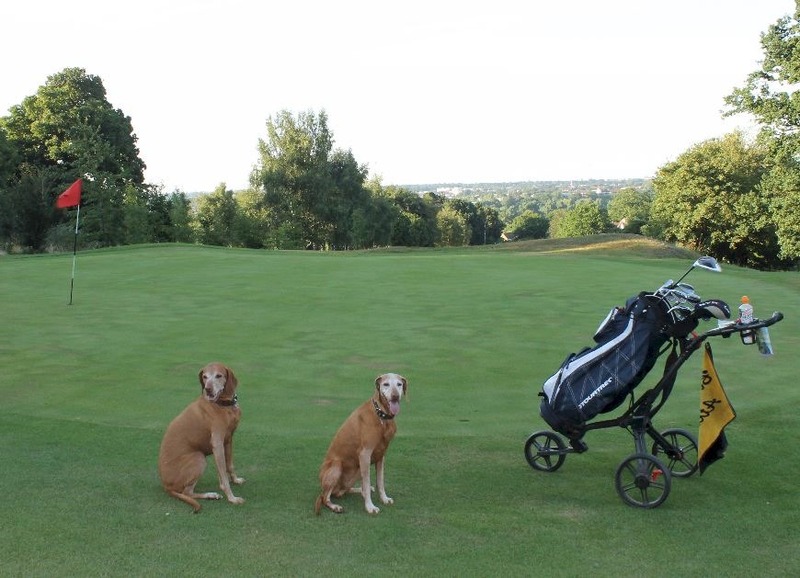 A bit of a hiatus for some overseas holidays (where the dogs can’t join us and there is actually not hardly any golf). But I thought I would send a postcard (or postcards) nonetheless to our readers. 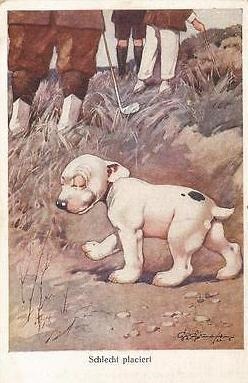 Some vintage cards depicting dog golf in various guises. 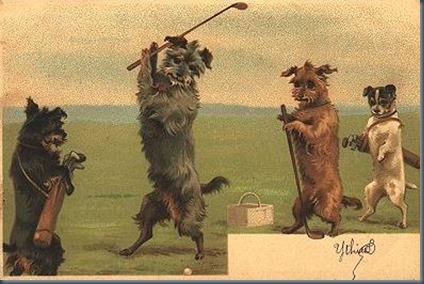 Dog golfing originates from the earliest days of the sport when it was a gentlemen’s pursuit. 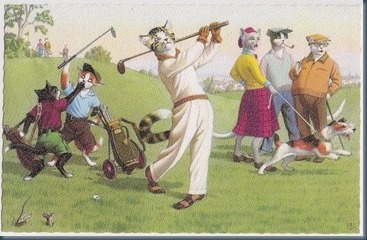 Well-heeled gentry would hunt in the winter and golf in the summer. Or in other words, shoot birds in the winter and shoot birdies in the summer. 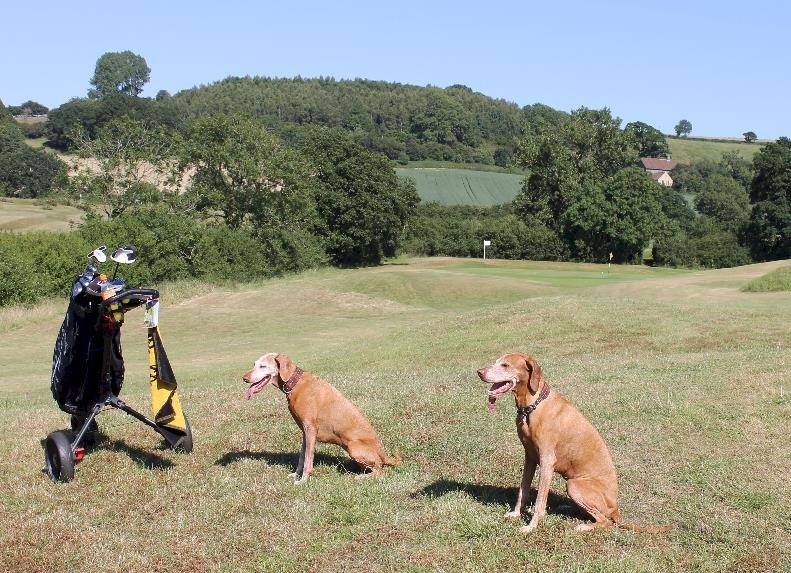 So it was quite common for a golfer to take his trusty hounds, who had served him so well in shooting season, when he had a sunny outing on the course. I recently saw some fun vintage golfing postcards displayed at St. Enodoc and wondered if any such prints had been done which included dogs. The ones I uncovered are shared here. 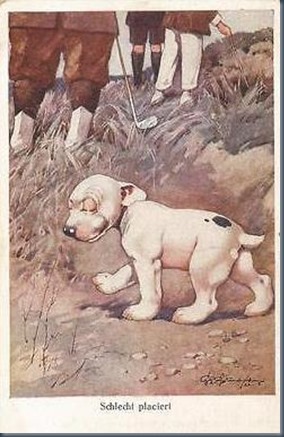 Welcome – The club’s official stance on dogs is that leads are required, but since there was virtually nobody on the course (there had been a club competition earlier during the weekend), the pro shop said we were okay to take them off the lead if we kept them under control and cleaned up after them. Over the course of the round, we did come across a walker with a couple of sweet golden retrievers who enjoyed meeting our girls and having a brief little play. Do statistical analysis of where people are most likely to hit their ball on the hole. Put one right there. Add some nearby for good measure. Heck, just surround the hole with sand bunkers. 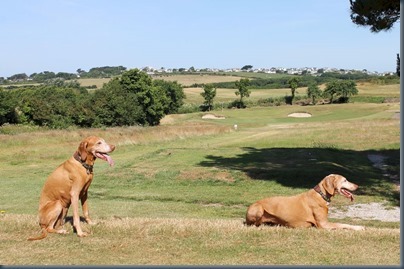 The 11th and 16th holes have 7 bunkers each. The area covered by the bunkers surrounding the par 3 13th covers more space than the green itself. Are the owners of the club owners of some sand and gravel who just sold off their gravel division? Very dog friendly course, but don’t bring your cat. 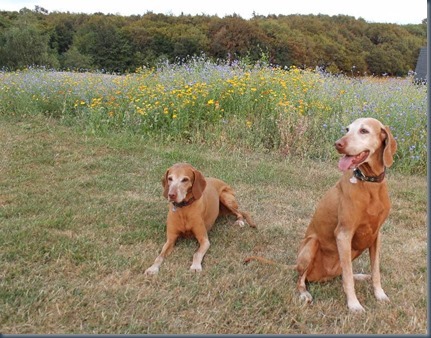 Walk – With the wide open spaces, Rusty and Grace enjoyed having a bit of freedom to stretch their legs. 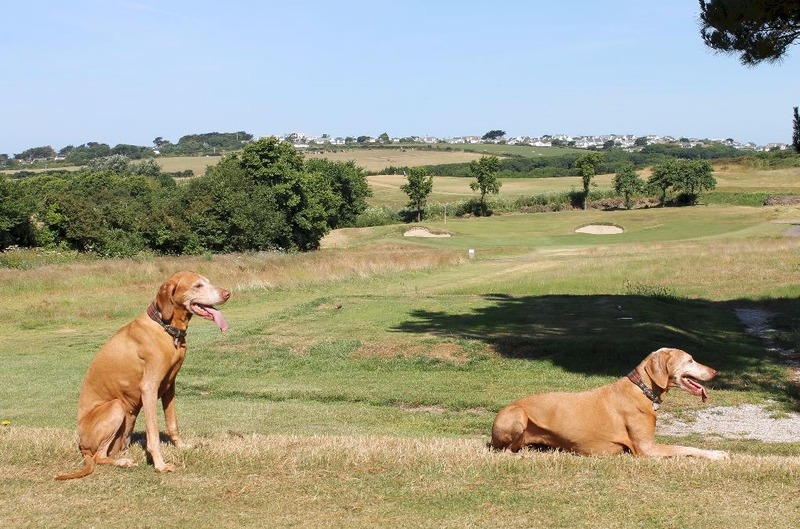 And while the fairly pervasive long grass lining the fairways turned out to be a bit of a nuisance for our wayward drives, Rusty enjoyed sniffing around in them and Grace got several treats for finding those balls in the rough. Water – There are two good sized water hazards on the course in good condition. One by the 17th and one which touches both the 6th and the 16th (so you the dogs can take a drink on both the front and back nine there). The water was in surprisingly fresh condition given the dry conditions. 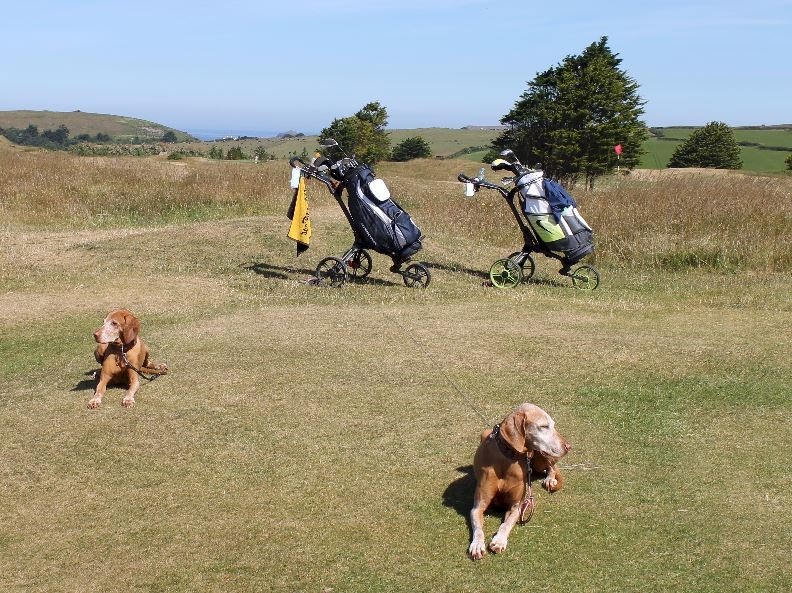 Wildlife – Not much visible except for flocks of gulls loitering on the fairway and a bit nonplussed by balls whizzing by them. As the sun set, we did hear the plaintive (and frankly bit distressing) crepuscular serenade of a libidinous monk jack. 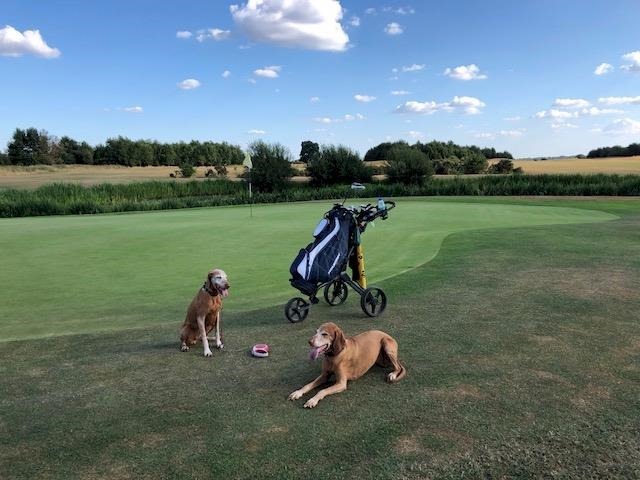 Wind Down – Squeezing out the last bit of summer sun, we didn’t get off the course until about 9:30 pm when all the pubs in the area had stopped serving food. 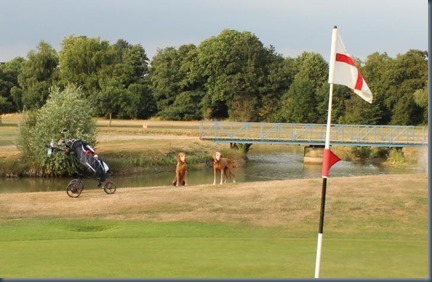 DoggiePubs recommended The Packhorse which is just round the corner from the course and our golf partners said she her bridge club played there periodically and it is a very nice establishment. Welcome – Richings Park is course with a very laid back vibe so a few puppies in tow didn’t phase anyone. Walk – Probably the flattest course we have ever played. 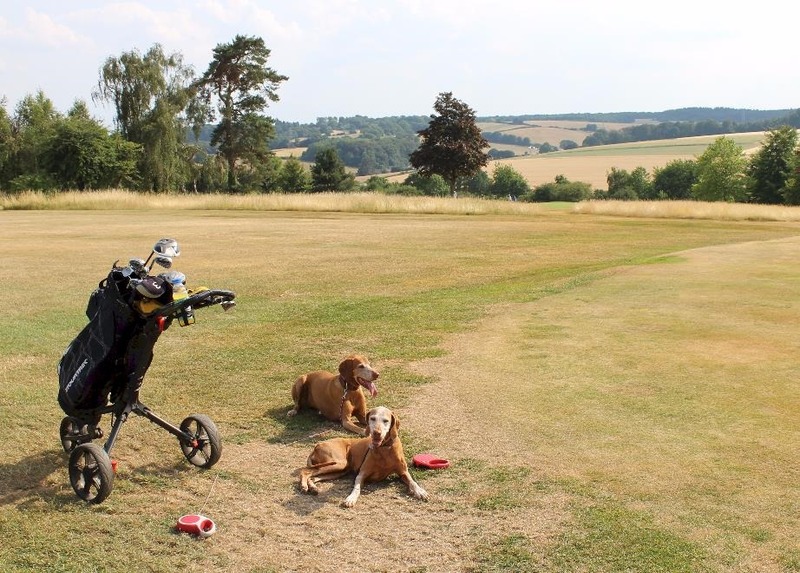 With it wide fairways that we rock hard from the recent dry spell, we clocked some of our longest drives setting us up for one of our best scores. Water – The 9th hole does finish by the clubhouse. A fair number of water hazards, but all were much too stagnant and algae ridden for even Grace to drink from them (mind you we are in the middle of a record heat wave which might have brought the features to record low levels of fresh water). Wildlife – A few random bunnies and squirrels scurrying about. Wind Down – We started heading off (courtesy of a DoggiePubs recommendation) for the Golden Cross only to be let down in a big way. We made a booking, but when we arrived they told us that they had shut the kitchen because it was too busy. Go figure. Obviously not an establishment keen on customer service (or even having more customers). But they sent us down the road to their “sister” pub, the Horton Arms. They were happy to welcome us and serve us food. Welcome – More like Harewood Ups and Downs. 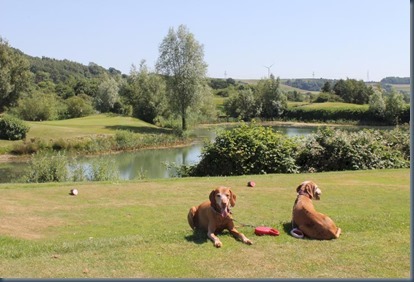 Harewood Downs first welcomes you with a stunning vista of the surrounding Chiltern countryside as the landscape plummets in front of the clubhouse exposing an expansive dell. And your first hole will present a similarly inviting descent as the fairway drops down a steep hill so a little tap down the middle will gain a hundred of more yards of just rolling momentum virtually right to the green. Possibly the most achievable birdie hole I’ve played in ages. Walk – But be careful…as the old saying sort of goes, ‘what goes down, must come up again!’ The entire course is a rollercoaster of thrilling downhill shots that will give you some of the longest drives of your career (once the ball finally stops rolling), followed by mountain climbing expeditions to re-conquer the course summits. 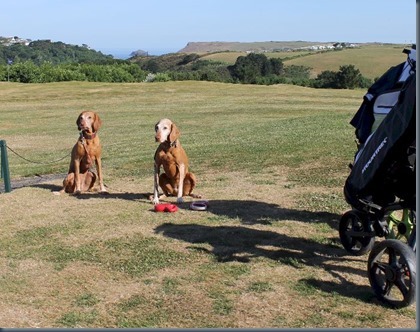 Most of the downhill fairways are blind so Grace’s ball sniffing skills came in especially useful not for finding the ball in the rough, but just finding out where in on the fairway the shot ended up (often dozens of yards more forward due to inertia). Thank goodness we had carts as lugging a bag around would have been downright Sherpa like. 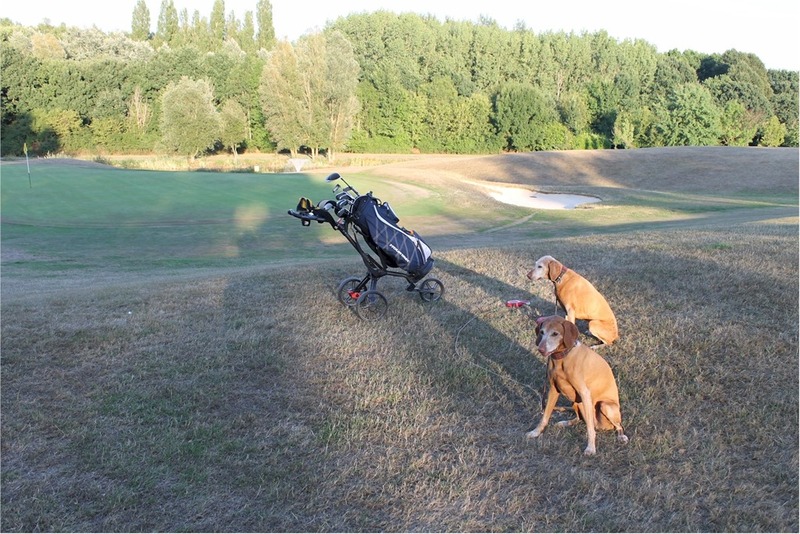 Wildlife – Just the normal golf course wildlife – squirrels, rabbits, llamas. Llamas?? Yes, there is a pen of domestic llamas at the 2nd hole. They are safely fenced in and seemed as curious about us as the dogs did about them (you might wanting to stay spitting distance away and I do mean that literally). Water – Not real water hazards (no ground flat enough to for water to settle on), but water fountains at the 4th and 10th holes! Great for dog owners getting a sip as well as filling dog water bowls. Wind Down – Despite our challenges with DoggiePubs.org last round, we turned to our trusty resource again and it came up trumps with the superb recommendation of The Swan in Amersham. 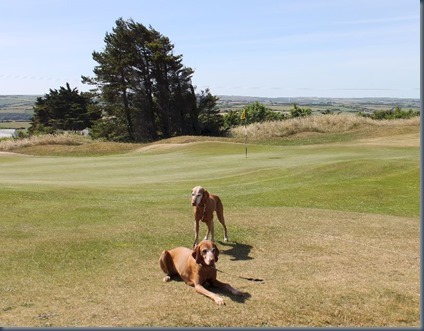 They have an expansive seating area by the bar with plenty of room to lay down the dogs’ blankie’s for a post-round nap while we eat (some pubs are so small and cramped we struggle to find a place to put the dogs that is not in the way). The food is gourmet standard and diverse (they have an entire vegan menu). 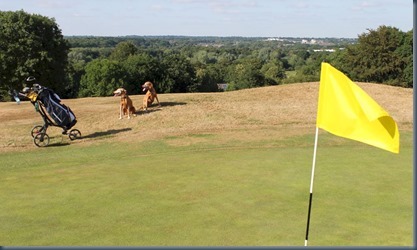 After an evening of ups and downs at Harewood Downs, we definitely finished on an “up” at the Swan. 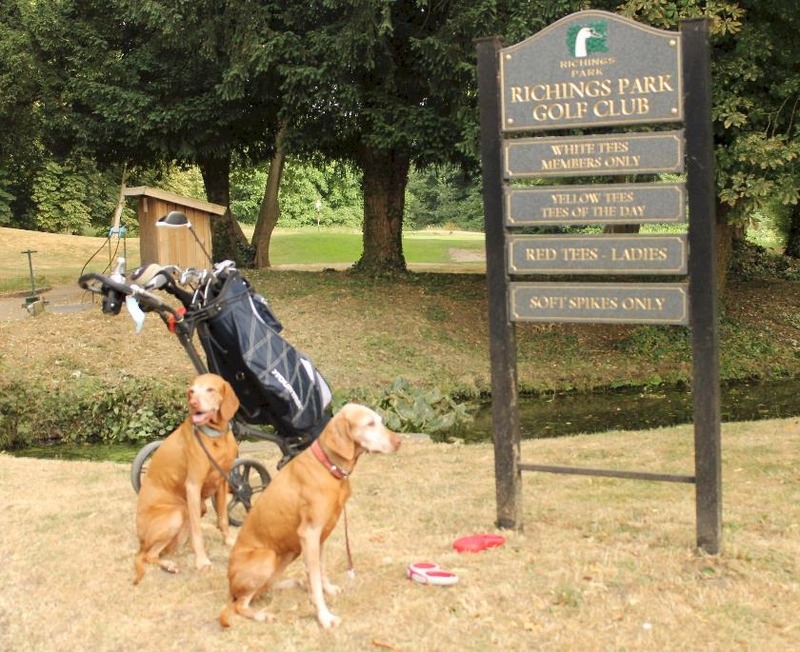 Welcome – Rickmansworth is very relaxed parkland course where every golfer who passed u as we approached the first hole stopped to greet Rusty and Grace. 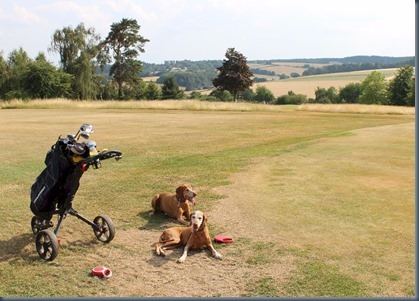 Walk – Like many Chiltern courses, it is a bit up and downy at least it is a bit shorter at 4446 yards. It feels like a proper course, but just more par 3s (7), moderate length par 4s (all around 300 yards), and only a single par 5. Wildlife – Beware the fox poo (Rusty found it and rolled in it), but no visible critters. Water – Nothing. Nada. No water hazards. Pack drinks for everyone in your party. 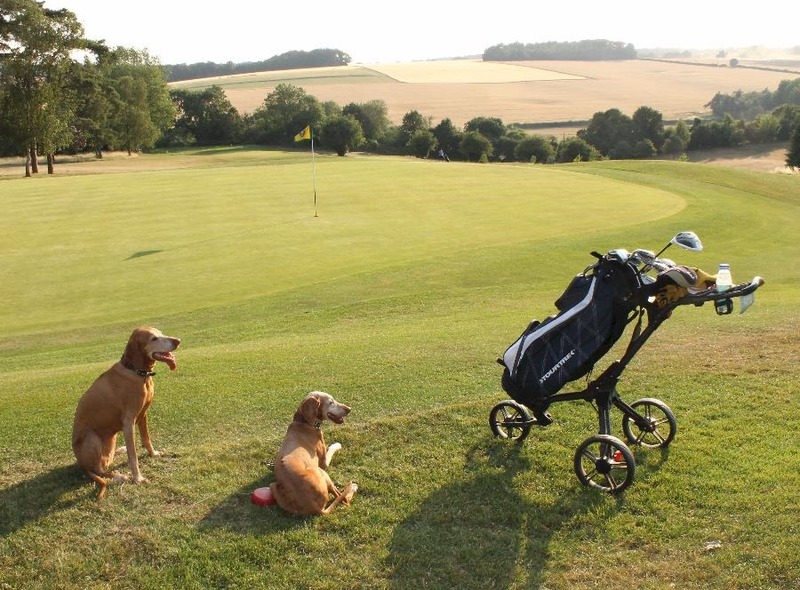 Wind Down – Once again DoggiePubs scored for us recommending the Rose and Crown in Amersham. Not just tasty food (we had steak and ale pie and specialty burgers), but also one of best vantage points for sunset over the Chilterns in its back garden (so maybe cut your round a tad short if need be to get there before the sun goes down). Thorney Park might just be our favourite dog-friendly golf course since Temple. 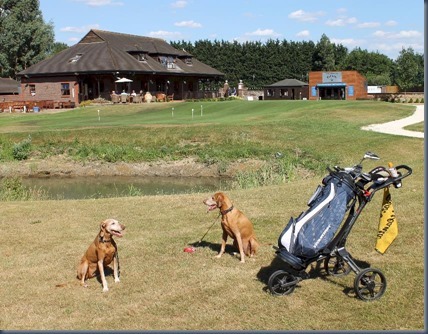 And Thorney Park bests it by (a) allowing dogs under control (lead not mandatory), and (b) having a very service-oriented clubhouse (especially serving food to hungry golfers). 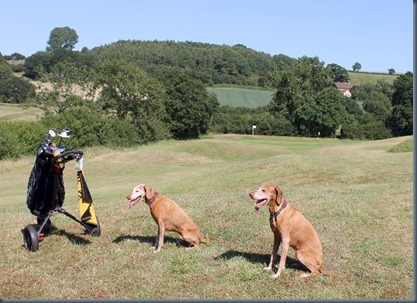 Welcome – One of the warmest welcomes we have received at golf course ever not just for the dogs. The gentleman in the pro shop asked if we had played there before and because we hadn’t, he gave us a comprehensive course guide (most shops charge for those). 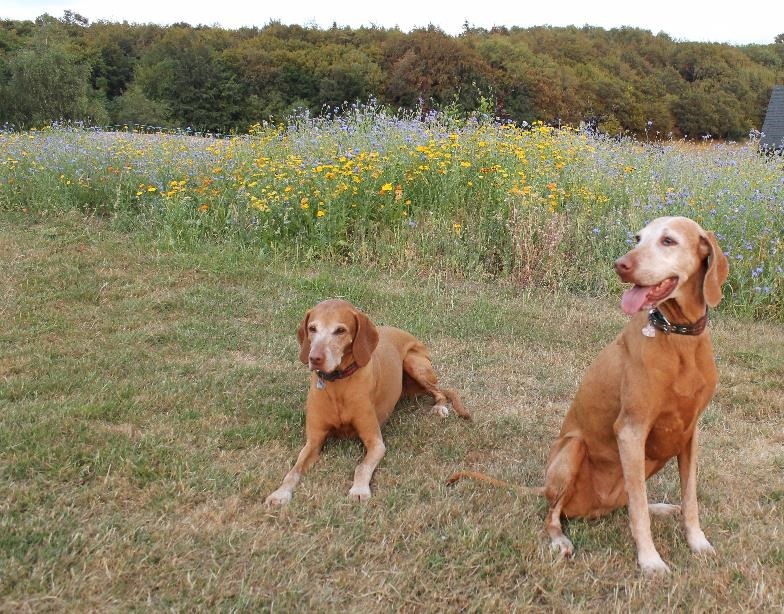 Throughout the day, everyone we encountered were enchanted by the dog and Rusty and Grace lapped up the attention. When we stopped at the clubhouse for a drink after the 9th hole, the manager Jerry came out and had a delightful chat with us. Wildlife – One of the ponds had a gaggle of Canadian geese swimming in it (including a family of newborn goslings), but well beyond the curious noses of Rusty and Grace at the water’s edge. Water – Water, water everywhere. There are 7 water hazards on the front 9 touching every one of its holes. Aesthetically picturesque. 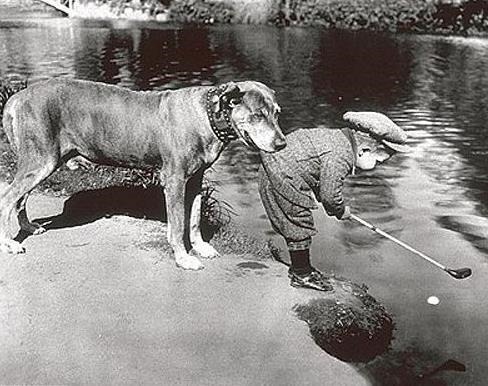 Providing a drink for the dogs, quite handy. The back 9 is a bit drier with just one long stream paralleling the 11th, but then also a quite dramatic water feature on the 17th. There you have drive over the stream (that continues to the 11th) and avoid going off the back to a big pool with a fountain. 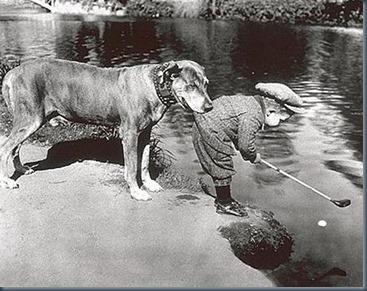 Well, it’s not just the ball you want to avoid going in the water. We learned a big lesson about dogs and vinyl lined ponds. Many ponds are lined with vinyl to keep water from leaching away. Grace and Rusty ambled over to the inviting pond for a sip of water and both slid right in on the vinyl surface. Not only that, they couldn’t get out! WARNING: Dogs going into vinyl coated ponds could get trapped. We saw their difficulty immediately and yanked them out from the bank, but they were a little startled by the situation. A bit more water than they bargained for. 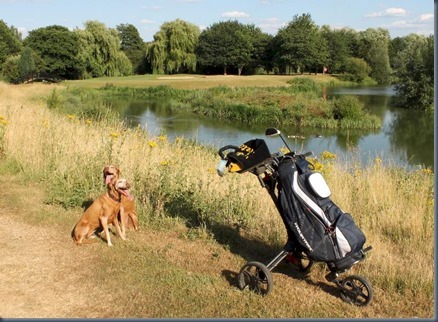 Walk – The many water features, punctuated by several footbridges, add to a very attractive scenery for the course. The vistas beyond the course do have a few more urban sights like a crane here and a metal structure there. And a major power line dissects the course crossing a couple holes (which just gave me a new/added excuse for my slice…magnetic field interference). But the most welcome aspect of the landscape were the shade trees. Some courses can be very wooded with lots of shade, but then you are threading a needle on your approach shots. Other courses offer wide open and very wayward shot forgiving fairways, but then you are exposed to the hot sun (or drizzle even). 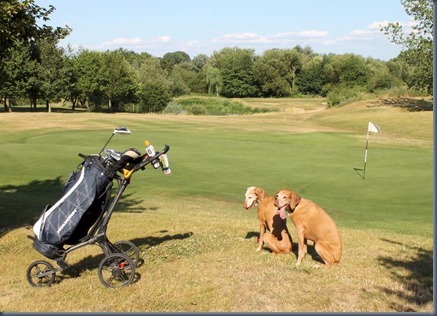 Thorney Park was a perfect balance of open lies with always (and I do mean always) a shade tree next to the hole where the dogs can sit down while you do your chipping and putting. Wind Down – Our first ever clubhouse wind down for dinner. Many clubhouses serve food, but many, like the pubs on Sunday, close the kitchen relatively early. 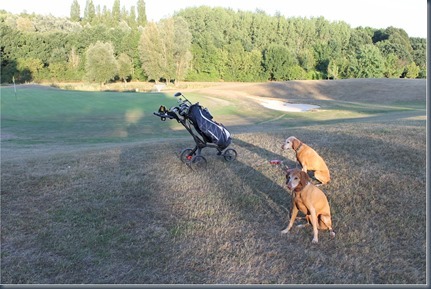 In the summer months, we like to hit the courses late in the day when there are few golfers (which is easier for golfing with the dogs) and it is a bit cooler. 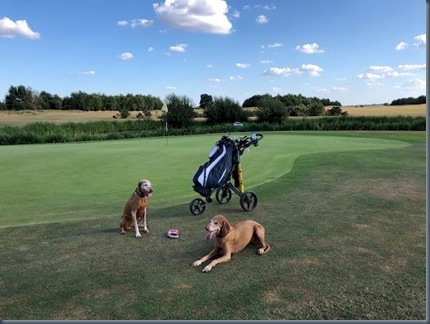 As it happens, when we decided to golf Thorney Park, we turned to our trusty DoggiePubs website and could not find a dog friendly pub with a seating after 8:00 pm. We went through a dozen pubs in the area and all were stopping earlier in the day. May pubs lay it on for a big rush for Sunday carveries and lunches and so finish up relatively early. But Jerry keeps the clubhouse open to dark which can be past 10:00 at night in the summer. He was happy to serve us up a late meal which was as tasty as it was appreciated. He had the butterflied Cajun chicken with chunky chips and a very satisfying side salad. All while enjoying the cooling summer’s evening on the terrace looking over the course. Welcome – Dogs are “most welcome” at The Point at Polzeath, as the pro shop attendant declared. 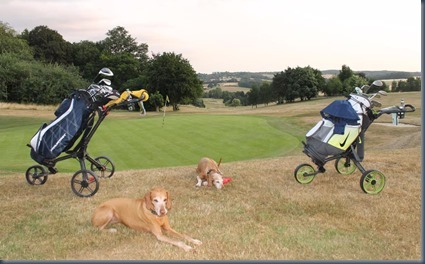 As it turns out, the owner has two spaniels who “chase him around the course”. 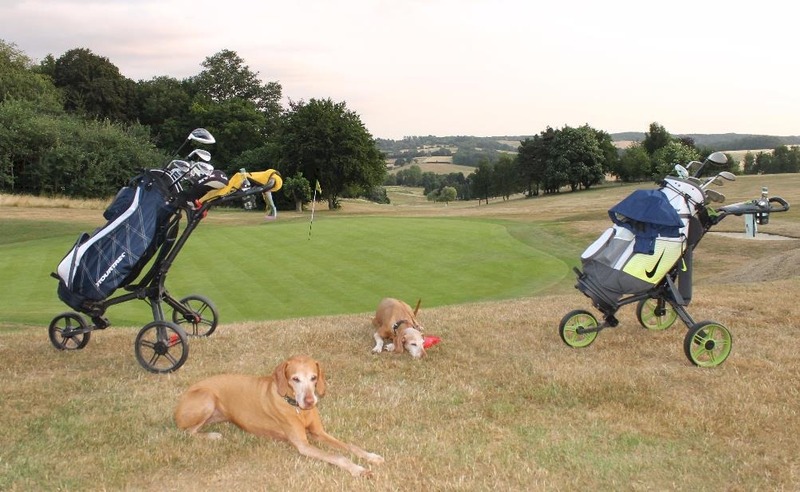 We came upon a number of dog walkers on the course during our round. Even the affiliated hotel is dog friendly. And in fact, this is the first golf club website I’ve come across that features a picture of a dog in its main gallery. Walk – The walk is a gorgeous seaside ramble. The course has wide, forgiving fairways and unforgiving greens set up on table tops (so the slightest inaccuracy leads the ball rolling precipitously off the side). You do have a bit of meandering to avoid the tsunami like bunkers of sand popping up everywhere. Water – A number of streams run through the course with fresh water…. Wildlife – …However, one of the streams were home to a family of ducks that did not seem pleased by Rusty’s attention (so onto the lead the she went). Wind Down – Our Polzeath outing provided the opportunity for a different sort of dog-friendly wind-down. We were just a few miles away from the foodie Mecca of Padstow. We had been to Rick Stein’s famous fish restaurant there years ago (and now Padstow is covered in Stein eateries and emporiums), but what we really coveted was a meal at Paul Ainsworth’s #6. Paul Ainsworth is my favourite celebrity chef. I was captivated by with warm and insightful coaching style on Master Chef a while back. Then, he graced Kerridge’s “Pub in the Park” in our home town last year. I thought he would send a few sous chefs to pump out a few token delicacies for the event, but instead he was right there on the front line working on every one of the hundreds of dishes they served that day. So hitting #6 had been on my culinary bucket list for some time. The problem was what to do with the dogs? Ainsworth at #6 is a lot of things, but it isn’t dog friendly. It turns out that the cottage we were staying at did not allow pets to be left alone. So we went on the hunt for dog sitter at very short notice with a quite unconventional brief (“could you look after our two dogs for a couple of hours?”). 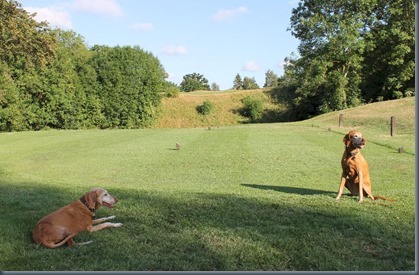 Fortunately, we discovered just the most professional, warm, and accommodating dog carer – Susan Sharp (and also poised and understanding in coping with an unprecedented bolt by Miss Rusty). She is in Wadebridge, right on the way to Padstow . 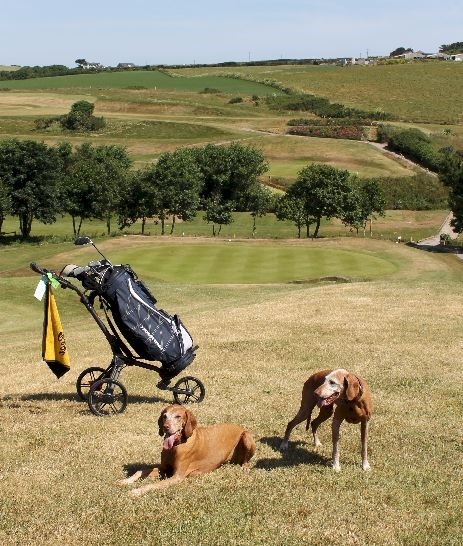 So if you want the ultimate post-round refreshment (or any other dog caring while vacationing in the area), I highly recommend you look up Susan’s service.